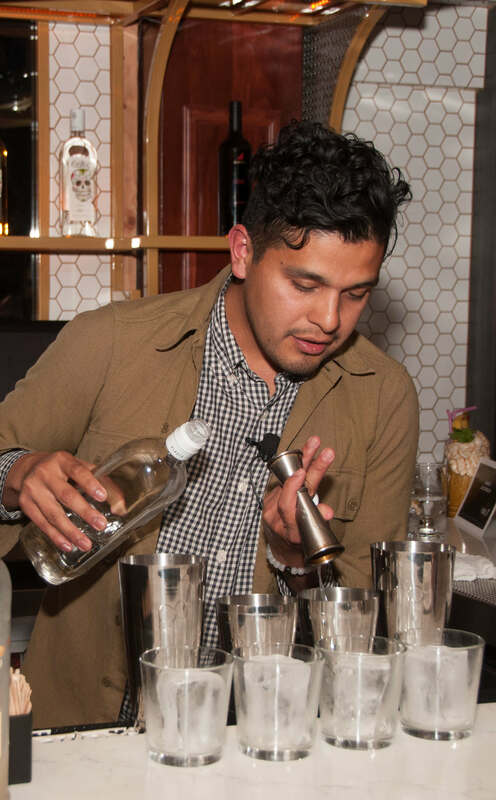 This year, Exotico® Tequila partnered with USBG for the second time to bring bartenders the Make It Exotico Cocktail Competition. We called on reputable mixologists from across the U.S. to create a unique cocktail using our 100% Blue Agave Exotico Blanco or Reposado Tequila as the base spirit. We spent much of this year traveling to San Diego, Austin, Indianapolis, Denver, Detroit, Raleigh, and Miami to find and judge the best concoctions. The winners from each city were selected for the chance to compete for the championship at Tales of the Cocktail in New Orleans. We are thrilled to give these bartenders get the opportunity to show off their tricks of the trade through this challenge. Read on to learn a little bit more about our finalists AND find out who won an all-expenses trip to the Exotico distillery in Jalisco, Mexico. What’s been your biggest bartender blunder? I was building three traditional whiskey sours and I handed one off to my bar back to shake. Then somehow his exploded all over me which made me drop my tins onto the floor and then those tins exploded. What cocktail best represents you as a person? A bitter Giuseppe because it’s great once you understand it. Origin of cocktail for competition? The name of the cocktail is called Swamp Leeches. It’s from one of my favorite movies, A Life Aquatic. I started out as a waiter at Chu Bar in saigon-Vietnam, and it was here the mixology bug first bit. Captivated by the creativity and customer interaction involved in the role, I moved to work at the Sedona Suites at the age of 20 and enrolled in a bartending school. After qualifying, I stirred and shook my way through a number of the country’s hotel bars, including luxury hotel Park Hyatt Saigon, where I gained the confidence to begin my journey across Asia to Europe and currently in the US. If a song played for your entrance, what would you want it to be? My Way from our All-Time Favorite, Frank Sinatra! That’s the Sedona! The drink is based on the Exotico Tequila Blanco combined with Amontillado Sherry; touch of Pineapple liqueur, balanced with key lime juice and passionfruit syrup; and dash of Lucid Absinthe. Inspiration took on the brand Tequila Exotico that I thought about the exotic to escape the life from a big city and stay somewhere to relax and enjoy for myself. I thought about my trip in Sentosa, Singapore where I enjoy at the south coast, Palawan beach with other bartenders across Asia during the bartending course. What cocktail best represents you as a bartender/person? I would say the Mai Tai would best represent me. A simple cocktail with a complex flavor. People have all different ideas of what a Mai Tai is but the ones that get to know the cocktail see how simple and complex it is. Superbad, because growing up is hard and fun. The inspiration for this cocktail was the Pina Colada. With using tequila I thought it would be appropriate to use a tepache which is a traditional fermented pineapple beverage native to Mexico instead of fresh pineapple juice to add a little more flavor to the cocktail and to highlight a very small apace of what Mexico have to offer. How did you become interested in bartending? I had always been in to bartending as an enthusiast but it didn’t really get started until my younger brother gave me a half off coupon to check out a bartending class that physically I became vested into the lifestyle. What’s the worst pickup line you’ve heard while working? Go on and feel my jacket. It’s made out of boyfriend material. The origin of the cocktail I am making came from my grandmother. As a kid she always kept a vegetable and fruit garden including blueberries and chili peppers. We were always in it as kids and as result always loved fresh ingredients and in particular spice. I named my cocktail The Spice of Life because creating a recipe outside the norm of what a day to day patron would order is what makes this industry grow and thrive. I needed cash, so I started bartending. I really needed cash, so I tried to do it well. Now I just really enjoy it. There’s certainly worse ways to make money. One Flew Over the Cuckoo’s Nest-It’s like Star Wars in a mental hospital with less guns and laser swords. Origin of the cocktail for competition? I always try to do something different or add an accent that would be unusual. The name comes from an old Grateful Dead song. All the best names come from songs or old literature. Most eye-opening event that’s happened while working? I saw a gentleman consume three bottles of wine by himself over the span of four hours and upon finishing his dinner, he did not so much as slur or show any sign of intoxication. Wow, you look like my ex-girlfriend. The name of the cocktail, as well as the role I am portraying is The Horny Jimador. The Horny Jimador is someone who combines their work hard play hard lifestyle, in a nutshell. His life is like the cocktail; spicy and exciting like Thai Chili syrup, refreshing like lime juice, sweet like dissarono, and down to earth like Cynar. The last nickname I had was in high school. People would call me Jigga.. Short for my crazy last name Jagodzinski. I have 3 pets. A cat, Weezer who is named after the band. 2 dogs Jax and Ginger, whom my kids named.. With a little help from Mom and Dad. My cocktail started with Sriracha. I wanted to create a spicy cocktail that used something other then a fire bitters or Tabasco and I love the flavor Sriracha brings. The name of my cocktail is The Spaisi Ginger…I do most my recipe writing at my kitchen table, when I wrote this recipe my 3 year old was imitating me. Spaisi was how she sounded out and spelled Spicy. I love any chance I have to incorporate my family into my recipes. The competition at Tales of the Cocktail was fierce and the cocktails delicious. After a heated battle, our judges selected Tara Jagodinski as this year’s winner. Congratulations to all of our contestants! If you want to try their Exotico craft cocktails at home (or your bar), download the recipe guide here. Special thanks to the USBG, Tales of the Cocktail and our amazing judges.